What causes a waterbed mattress to smell? The following advice is based on approximately twenty five years of experience in the waterbed industry, in both the UK and California. 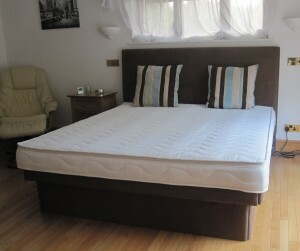 Also input from other retailers, The British Waterbed Association and our customer feedback. We are not scientists, so if you are a water bed owner and have beneficial advice or something to add, rather than criticising this advice, please add your feedback. Over the years a very small percentage of customers have reported a smell from the waterbed mattress. The smell can be described as stale straw. This does not sound too bad, but the smell fills the room and bed clothes. The smell is intolerable and the water bed is no longer usable. This smell should not be confused with the smell of new vinyl which can be strong for the first few days, but gradually wears off. This is always the case. A waterbed mattress is made from PVC (Vinyl). The filling to stabilize the movement is polyester fibers. Neither the vinyl or water bed fiber can produce the smell described above. The cause of the smell is bacteria in the water. When a waterbed is new, it is filled with water and eight ounces of specially formulated waterbed conditioner are added. This is twice the dose that is required every six months, but will give the water bed mattress a good clean start. Two causes for the waterbed mattress to start smelling. First, if the waterbed mattress is several years old and the owner has missed or been late adding the conditioner, then bacteria can start to grow in the water. A waterbed is temperature controlled making it an ideal breading ground for bacteria if conditioner is not added regularly. Also ensure that you take any air from the water bed mattress whenever you hear it as this is annoying and will also encourage bacteria to grow.